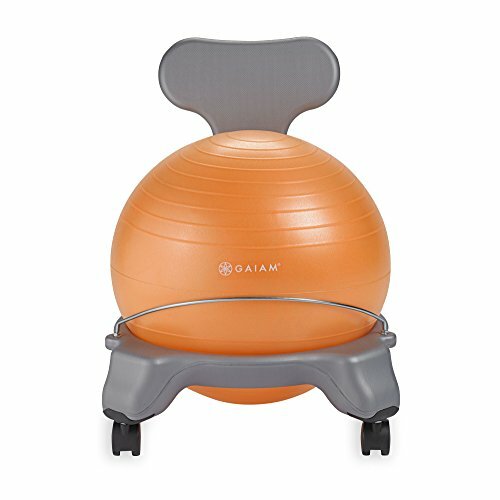 Make learning fun with the Gaiam Kids Balance Ball Chair! This ergonomic seat for children designed to promote concentration and active learning by giving kids an outlet for their excess energy. Kids will love this healthy and fun alternative seating whether it's at home or in the classroom. This stability ball chair will excite your kids to learn, reduce restlessness and fidgeting while promoting a healthy posture. Statistics have shown that kids are able to focus more intently when actively balancing their body on a yoga ball. Perfect for flexible classroom seating with active, high energy students - keeping their mind focused and body engaged. Recommended for kids ages 5-8 or heights between 42" - 51" (42 to 51 inches tall). Weight limit: 175-pounds. Includes: - 38cm Balance Ball - Air pump - Adjustable back support bar - Secure metal ball holder - Easy-glide caster wheels (2 lockable) Gaiam is a leading lifestyle brand with a mission to make yoga, fitness, and well-being accessible to all. Gaiam was created as a lifestyle company with the vision that, given a choice, people would choose a lifestyle that is healthy and life enhancing, for themselves, their families and the Earth. The Gaiam wellness, yoga, meditation, and recovery lifestyle is a vote for individual health as well as the future sustainability of the Earth's resources. Gaiam strives to provide customers with alternatives to traditional products by offering natural or healthy versions that compare with the style, quality and price of conventional products.